A utility for splitting and compressing email messages with large attachments into multiple emails. The large files packing is also divided into some parts of the specified size. 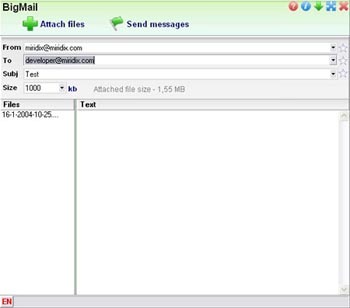 Then some messages are prepared and transferred to the default mail client. The convenient and intuitive interface allows performing this routine operation very quickly. The product is distributed in two versions, standard and professional. - changing the size of messages Plus all new features will appear only in the professional version, the standard version will be updated when the major version is released.